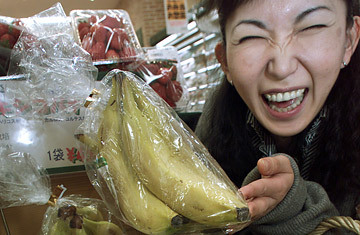 A customer beams during selection of bananas at an organic food market in Tokyo. Keiko Akai is very annoyed. The attractive 21-year-old university student has been planning to do a banana diet for some time now, but she can't get started  and not for lack of trying. "I keep going to OK Store, my local supermarket every single day," she says. "In fact, I've just been there. There are no bananas on the shelves, and it's been like that for a month." "Large stores don't have any bananas from noon, and even Ito Yokado (a major supermarket chain) runs out of them after 3 p.m.," says Tomoyuki Horiuchi, sales representative of Tokyo Seika Boeki Co., Ltd., fruit and vegetables wholesale company. Hiromi Ohtaki of Dole Japan, a leading banana importer, sees the boom in sales as largely due to Morning Banana Diet  bananas don't normally sell well during summer, and this year's summer has been especially hot. Still, over the past 4 months, demand has driven Dole Japan to increase its banana imports by upward of 25%, and even then supplies could not keep pace with demand. "In a way this is an emergency," explains Ohtaki. "We've been importing bananas from the Philippines for the past 40 years, but this is the first time something like this happened to us, and we find it very difficult to cope." Professor Masahiko Okada of Niigata University School of Medicine questions the hype around the banana diet. The human body has three essential nutrients  carbohydrates, fat and protein , he says, and "the golden rule is to balance these three nutrients and a daily calorie intake. Once you understand that, you don't have to be swayed by the fad diet any more, whether it is a konnyaku (alimentary yam paste) or a banana diet." But a nation prone to dieting fads often ignores such sober advice.